A picture of the rock with the drawing on the Wits University website. The sketch was drawn on a tiny piece of rock some 73,000 years ago by hunter-gatherers in South Africa. The abstract design has a vague resemblance to a popular symbol of the internet age -- the hashtag. Scientists have found a tiny fragment of rock marked with intersecting lines of red ocher pigment some 73,000 years ago. The discovery is the oldest-known example of drawing by humans, the scientists said. It predates the previous oldest-known drawings by at least 30,000 years. The abstract design, vaguely resembling a hashtag, was found in Blombos Cave on the southern coast of South Africa. It was drawn by hunter-gatherers who periodically dwelled in the cave overlooking the Indian Ocean. The find points to the existence of modern cognitive abilities in our species, Homo sapiens, during the Middle Stone Age, the researchers said. While archaeologists have found older engravings around the world, including one in Java that is at least half-a-million years old, the "hashtag" is the oldest-known drawing and not just a collection of random scratching. It shows early humans used different techniques to produce similar signs on different surfaces. 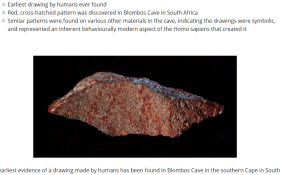 There have been several other artifacts found in Blombos Cave, including ochre pieces engraved with abstract patterns resembling the one drawn on the stone as well as ocher-covered shell beads. Modern humans, known as Homo sapiens, first appeared more than 315,000 years ago in Africa, later trekking to other parts of the world.